Happy new year to you all (well, the ones who read this blog anyway…)! After a fairly quiet Christmas period it’s time once again to spring into action and get stuck in to what may well prove to be a busy spell (my god…!). I’m gonna be out and about with Beth doing a few one offs and starting out at her new residency at Cherry Jam on Porchester Road (www.cherryjam.net). Clare is soon to commence her busy touring schedule for 2008 and Maggie has got a bunch of shows lined up for the Spring in Germany and Scandinavia, I’ll post them when they’re all confirmed. 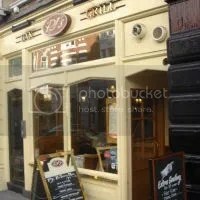 One little bit of exciting news (for me anyway), after much to-ing and fro-ing, Paul Eldridge and I have managed to revive our residency at PJ’s in Covent Garden (Wellington St, opposite The Lion King). We did this gig for years every Thursday night at 10.30, but it folded when the management changed. After a few odd gigs there over the last year, we have persuaded them to take us back on every week. So if you’re knocking about town in the wee small hours of a Thursday night, do drop in and say hello. This entry was posted on Thursday, January 3rd, 2008 at 7:36 pmand is filed under . You can follow any responses to this entry through the RSS 2.0 feed. You can leave a response, or trackback from your own site.